Contact details: service@valvan.com or service@gualchierani.com or call +32 56 521 387. 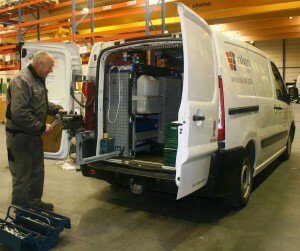 The fast and reliable worldwide service is carried out by our trained technicians and engineers. Our service department is responsible for the planning of installations of new machinery and trouble-shooting for existing installations. Contact details: spareparts@valvan.com or spareparts@gualchierani.com or call +32 56 521 491. For production plants, it is essential to reduce downtime to a minimum. This is only possible if you have the most critical spare parts in stock, so that a technical problem can be solved quickly. As the lead time of hydraulic spare parts can vary from a few weeks to a few months, the importance of having these critical spare parts in stock is obvious. 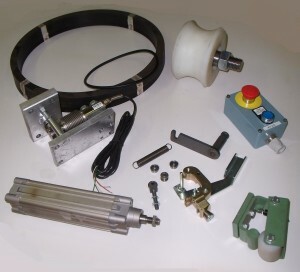 We can provide you with the necessary spare parts to create your own minimum stock for your bale pressing plant. 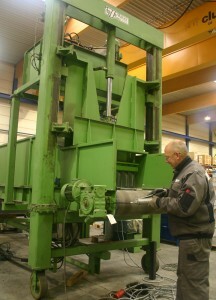 Not only for the baling presses produced by us, but also for baling presses from other manufacturers. Over the last 15 years, Valvan has taken over several well-known baling press manufacturers, such as LVD (fiber baling presses), Piferoen, Ateliers St Eloi (bump presses) and Gualchierani. Some of these manufacturers have been producing baling presses for more than 50 years and the machines were exported all over the world. Many of them are still running in production plants. Also for these baling presses, we can provide the required spare parts. The term ‘if it’s not broken, don’t fix it’ still applies to many industries. But due to increasing costs of downtime, we want to emphasize on the benefits of preventive maintenance. Operator and machine safety: By performing a regular preventive maintenance, you are assured your equipment remains to operate under safe conditions, both for the machine and the operators. Possible issues can be nipped in the bud before they have a chance to cause harm. Machine efficiency: Normal wear and tear can result in lower machine efficiency. Preventive maintenance assures optimal working conditions and conserves the life span of the equipment. Time savings: A planned preventive maintenance may cause small hindrance for production, but that is nothing compared to actual downtime caused by a breakdown. Because it is planned, production can propose the optimal time and can factor in the nuisance. Preventative maintenance procedures take less time than emergency repairs and replacements. Procedure: Our technicians dispose of a fully equipped service vehicle with all necessary tools for maintenance and small repairs. During a preventive maintenance on an installation, a maintenance report is made up, in which all hydraulic, pneumatic, electrical and mechanical parts are checked. Remarks are noted in the maintenance report of which the customer receives a copy.